Just yesterday we got word that Kourtney Kardashian and her young model boyfriend Younes Bendjima called it quits after two years of dating. The report was accompanied by photos of Younes hugging up on Jordan Ozuna, who has previously dated Justin Bieber and Tyga. 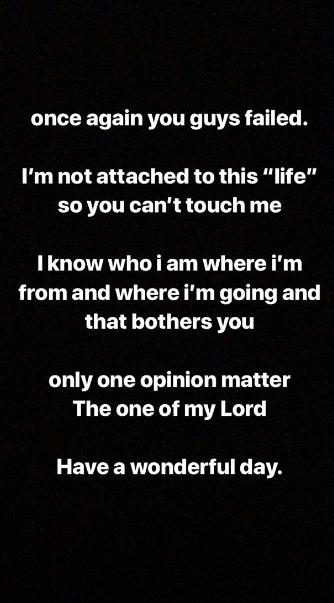 Not even 12 hours after the story was published, Younes jumped on Instagram to slam the reports, labelling Jordan as just a friend. “Can’t have fun with your friends no more,” he wrote on his Instagram story, as seen below. In another post, he shared a message to Hollywood detailing how he's not for the life of fake headlines and trash rumours. "Once again you guys failed," he wrote. "I'm not attached to the "life" so you can't touch me. I know who I am where I'm from and where I'm going and that bothers you. Only one opinion matter The one of my Lord." Despite all the 'fake' news, Younes has only shut down the rumours of dating Jordan...he hasn't denied that he and Kourtney are over.